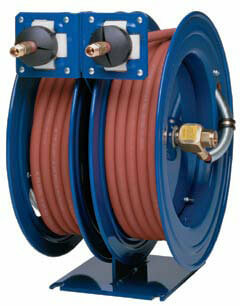 We provide a dependable performance for spring driven hose reels as well as hose reels with hose. 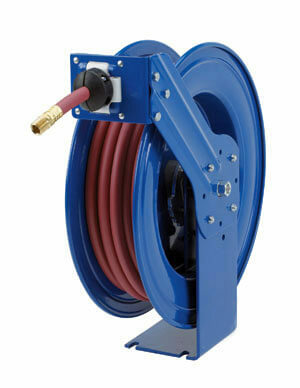 With larger chassis and frame, these automatic hose reels can accommodate longer lengths and larger diameters. There are two support points to the center shaft with super hub that reduces vibration during operations. This series of heavy duty hose reels feature a larger chassis and frame to allow for longer lengths and larger diameters of hose. Super Hub design has two supports points to the center shaft which increases the stability during operation, reduces vibration, and strengthens the structural integrity of the reel. Available without hose also. 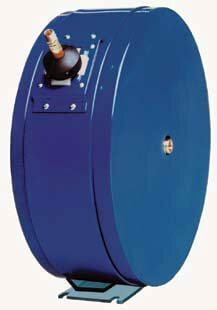 Reels are furnished with standard one wire braid hose suitable for air, water or oil applications. Maximum temperature 250° F.
Note: Do not exceed listed hose O.D. to obtain maximum length. Reels are furnished standard with S.A.E. 100R16 #1 or #2 wire braid hose suitable for grease and hydraulic oil applications. Maximum temp. 250° F.
1 8-3/4" 21" 19-5⁄8” 6" 6" 4"-5"
2 9-1/4" 21" 19-5⁄8” 6" 6" 4"-5"
3 9-3/4" 21" 19-5⁄8” 6" 6" 4"-5"
If you are looking for a tough spring driven hose reel, the T-Series "Truck Mount" hose reel is the hose reel for you. Designed for the most abusive, rugged terrain, the T-series is constructed from professional grade heavy-duty steel with a proprietary CPC powder coat possess made to last a lifetime. These sports an extra large chassis supported by dual pedestal arms that span from the roller guide bracket to the sturdy mounting brace, with triple support points to ensure that while off-road or on it, your mobile hose reel is going nowhere. 3 9-1/4" 25-1/2" 23" 8" 9" 7"-8"
5 9-3/4" 25-1/2" 23" 8" 9" 7"-8"
Compact, versatile and uniqe design that these reels can mounted on any vertical flat surfaces. A 360 degree hose direction that can be easily used from back to front, top to bottom directions. 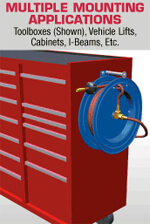 Great for air/water service units, tool benches, tool boxes, vertical walls and beams, vehicle lift systems, machine tools, service vehicles applications. 5 19" 7-3/4" 20-1/2" 14-7/8"
6 19" 8-1/2" 20-1/2" 14-7/8"
Perfect for applications in which two sources are needed to get the job done when space is a critical factor. The single mounting base creates stability and adds convenience of one mounting pattern. Available without hose also. Guide Arm Adjusts to Wall, Floor, and Overhead Positions. 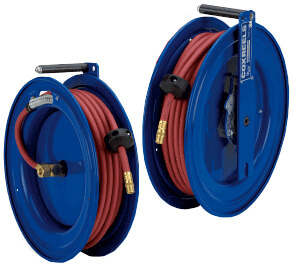 3 12-1/2" 18-1/4" 17-1/4" 8" 9" 7"-8"
The enclosed series of spring driven hose reels are protected by a powder coated steel casing that shields out the elements to protect and extend the life of the reel, the hose, and the components inside. Ideal for work environments that demand a clean and professional look. The three piece casing is easy to assemble and disassemble for simple installation and maintenance. Available without hose also.